Deep fryers are a fun and unique way to cook many of today’s most popular foods. While some are now looking toward air fryers for a healthier option, there are foods that need a deep fryer to do it justice. They’ll handle the traditional fried favorites such as corn dogs, chicken, and fries as well as trendy options like fish tacos and fried ice cream. Owning a good commercial fryer will allow you to make all of these delicious foods quickly and in large amounts that serve many people at once. 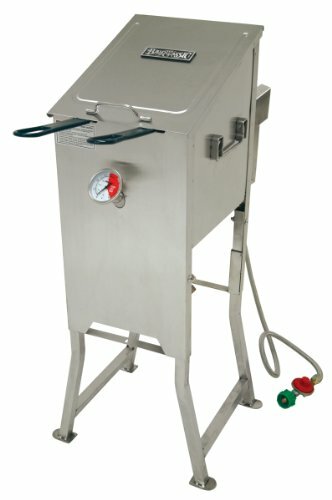 The following are the top ten picks in commercial fryers. 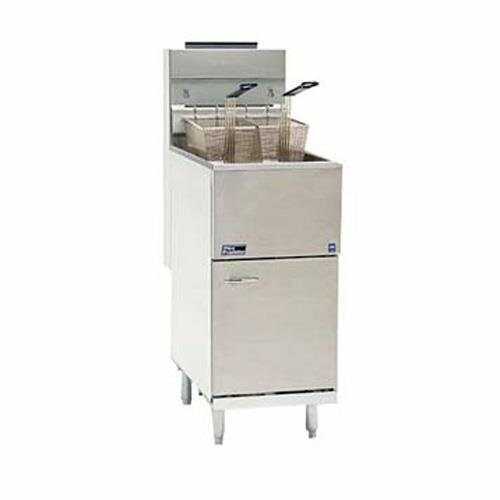 This commercial fryer includes a stainless steel, 12 liter dual tank with a temperature range of 140° to 392°F. The heavy duty construction makes it a reliable choice that comes with dual power plugs so that it can be used as a single basket fryer. Oil splashing is minimized with the use of the lid covers which are included along with the steel baskets. This model measures 23 by 18 by 12 inches, making it ideal for countertop use. Each basket is 7 ¼ by 8 ¼ by 4 ¼ allowing for plenty of food to be prepared in one dip. The 9 ½ inch long handles provide users with extra safety, and the 59 inch long power cord gives you freedom to use it in various locations throughout the kitchen. 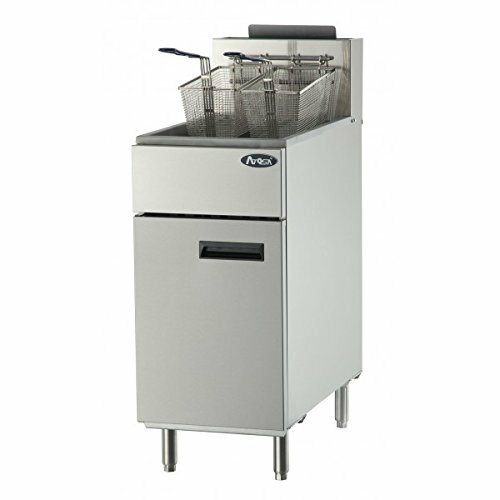 This fryer has an all stainless steel construction that includes two ample fryer baskets. The no-scorch design has incorporated four gallon fryers that are some of the most efficient ones available today. 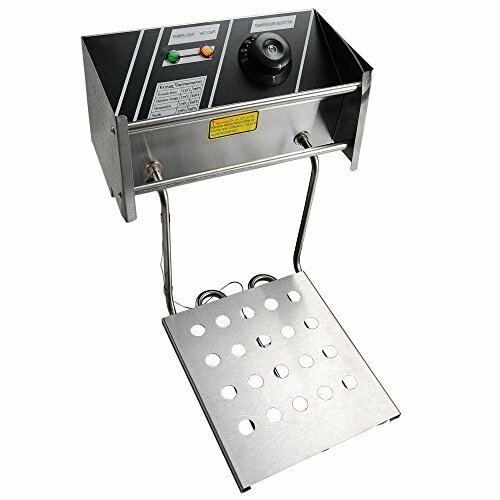 With your purchase you will find two of the stainless steel fry carts, a drain valve, temperature gauge, stainless steel braided hose, a 10-PSI regulator kit, and extension legs. Batter won’t burn and your oil will stay cleaner with the V-bottom design which keeps the oil temperature at the base cooler. The entire piece measures 38 ½ by 14 ½ by 11 ½ inches, making it a nice size for any commercial kitchen. This 20 liter, 3000 watt dual tank electric deep fryer is made in the United States with an all stainless steel construction. It includes timer controls as well as drainage faucets, and is designed specifically for commercial use in restaurants, fast food establishments, and supermarkets. Boil oil splashing is prevented by the lid covers, and the fry baskets come with 9 ½ inch plastic safety handles. Working procedures are monitored by indicator lights and the on/off switch. Each tank holds 10 liters with a temperature range of 140° to 392°F. The entire piece measures 22 ½ by 18 by 13 inches with basket dimensions of 8 by 8 ¾ by 4 inches to hold plenty of servings at once. Each tank has its own power plug so that this model can also be used as a single tank design. This dual basket fryer offers you functionality you can count on with a heavy duty stainless steel design. Thermostats give you complete control for accurate temperature setting, and the dual power plugs allow it to be used as a single tank application as well as a dual tank model. The lid covers are provided in order to prevent boil oil splashing, and the residue plates can be used to filter out the dregs. With a temperature range of 140° to 392°F it is ideal for chicken, Buffalo wings, egg rolls, and dumplings in a restaurant setting. This piece measures 23 by 18 by 12 inches with 7 ¼ by 8 ¼ by 4 ¼ inch baskets. Dual power plugs make it a versatile fryer. 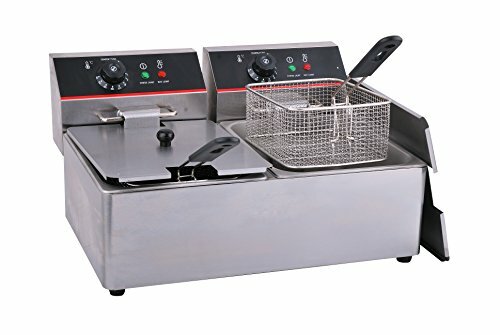 This commercial grade fryer has an all stainless steel construction with 60 minute timer controls and a heavy duty copper faucet for edible oil draining. An ideal piece for fast food, restaurants, or supermarkets, this model has lid covers to prevent oil boil splashing. The 9 ½ inch plastic handles on the 8 by 8 ¾ by 4 inch baskets provide additional safety. A 59 inch long power cord gives you plenty of freedom in its placement within the kitchen, and the over-all size of 18 by 11 by 13 inches makes it a nice compact size that won’t take up a lot of usable work area. The rotating fryer head makes for easy clean up, and the on/off switch and the indicator lights help you monitor your working procedures. 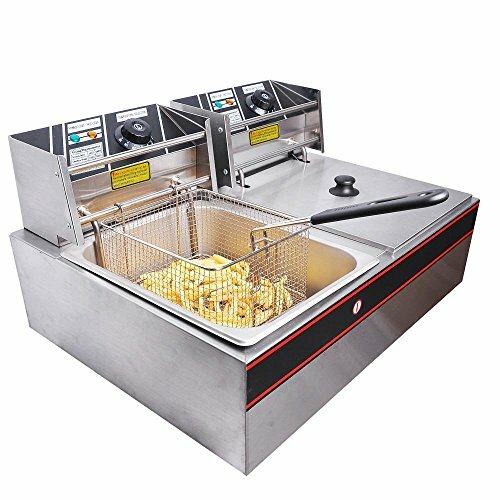 This particular fryer is suitable for commercial use as well as home use with an over-all size of 11 by 17 ¼ by 12 inches. The stainless steel design is certainly heavy duty enough for commercial use in a restaurant setting with thermostats that allow you to achieve accurate temperature settings. Boil oil splashing is prevented by the lids that come with this piece, and the fryer basket has a 9 ½ inch plastic handle for safety. It works wonderfully for wings, dumplings, chicken, mozzarella sticks, and more with a basket dimension of 7 ¼ by 8 ¼ by 4 ¼ inches. It is a single basket model with a 39 1/3 inch power cord. 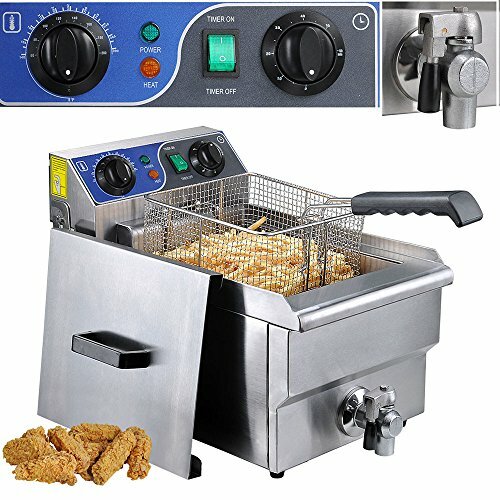 This professional fryer has an eight liter capacity with a 120V, 1500 Watts, 15 amp, 60Hz power rating. It reaches a maximum temperature of 392°F with a 9.5 by 7.5 by 5.5 inch basket. This commercial fryer has a beautiful look with restaurant quality, brushed stainless steel, and it includes a one year warranty. 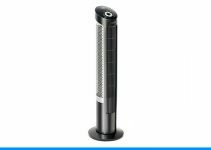 It has plenty of extra features such as the counter balanced, hinge out heating elements and indicators that show the heating situation. The over temperature safety cut out feature means you’ll avoid dry burning. It’s easy to clean with a dismantled and folded handle. With an over-all measurement of 18.5 by 15 by 13.2 inches and a weight of 16.6 pounds it easily fits into any commercial kitchen setting. This fryer stands out with its natural gas functionality and floor model design. It includes three tubes and a 90,000 BTU construction. With an over-all measurement of 31 by 16 by 46 inches and a weight of 161 pounds, this fryer will need a permanent place within your professional kitchen. With no need for a power cord, it can be placed anywhere there is a gas source. It can be used with propane gas as well with an additional purchase of a valve hook up. As with many of the electric fryers, this commercial piece comes with dual baskets that provide ample room for preparing favorites such as chicken, fries, egg rolls, and dumplings in any restaurant or supermarket location. This commercial gas fryer works is an ideal commercial solution, fully compliant to all relevant regulations in the USA. Inspired and based on the traditional USA design, and made from professional grade stainless steel. 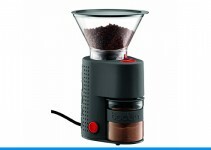 It comes with a 40 LB capacity across the two included baskets with an oil cooling zone at the bottom of the tank. 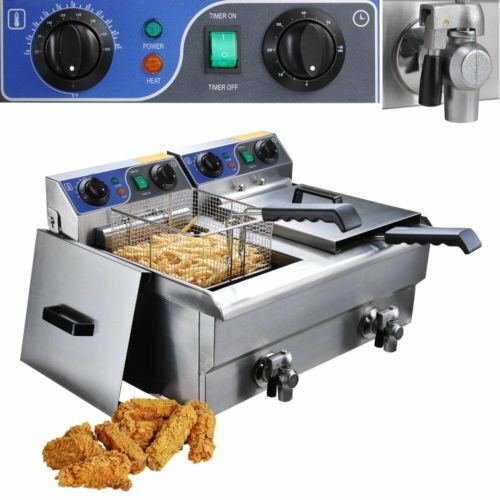 This commercial fryer works wonderfully for fish, chicken, onion rings, and much more. 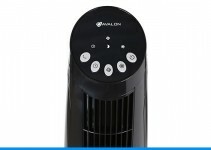 It comes with a self-resetting high temperature limiting device to ensure temperature remains within a safe range and the high pressure gas burners operate up to an awesome 104,000 BTUs. 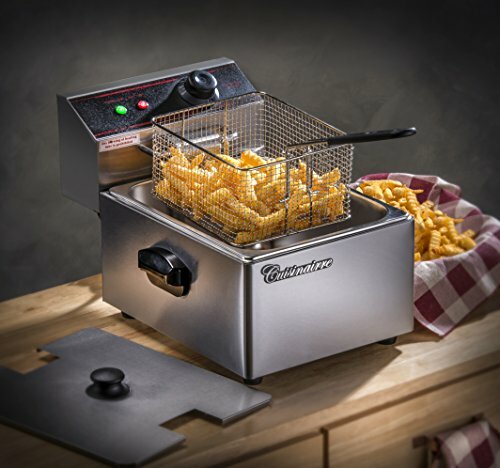 This fryer features a commercial grade, brushed stainless steel construction along with heavy duty fry baskets and two 1750 Watt immersion heating elements. It has a total oil capacity of 12 liters between the two tanks. Each side maintains a temperature range of 140° to 392°F with its separate thermostats. Two power cords are included so that it can also be used as a single tank fryer. The entire piece measures 17 by 21.2 by 12 inches and weighs 19.5 pounds. It is manufactured by the Shadow Ridge Trading Company, and it will provide you with dependable service that is backed by a one year warranty.